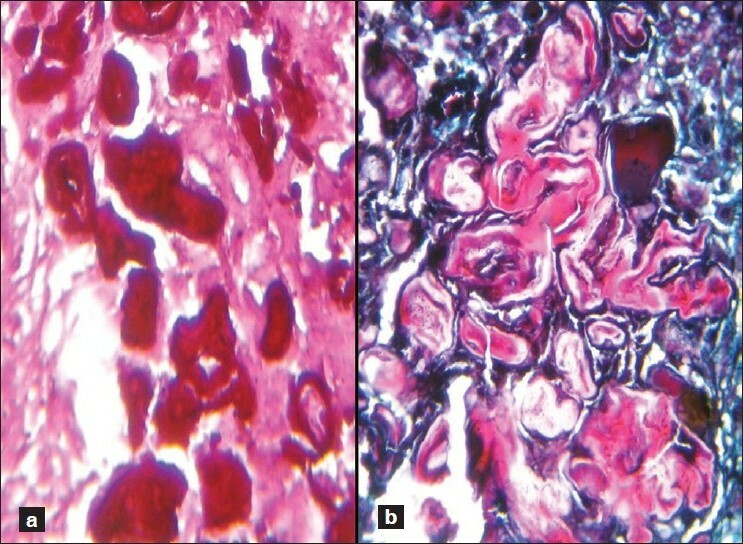 Rushton bodies (RB) or hyaline bodies in odontogenic cysts feature as eosinophilic, straight or curved, irregular or rounded structures within the epithelial lining of odontogenic cysts. Data from published studies suggest an overall incidence of about 8%. The origin and nature of RB have been hotly debated. Two out of 50 cases of odontogenic cysts examined showed the presence of RB. Both were radicular cysts occurring in females aged 40 and 42 years. The anterior maxillary region was involved in both with radiological findings of unilocular radiolucent cysts affecting the apical region of non-vital tooth. The cysts' sizes were 3.5 and 1.5 cm, respectively. They were enucleated. 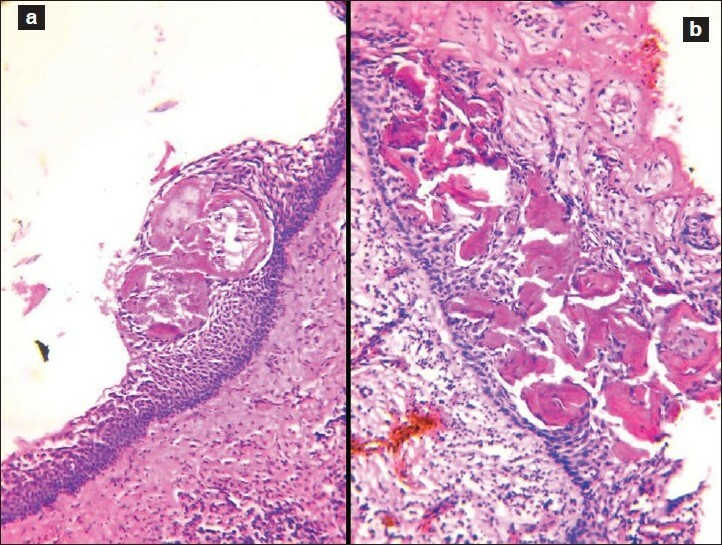 Histopathologic examination showed the cysts to be lined by stratified squamous epithelium which was variably thickened or attenuated and focally ulcerated. Dense lymphoplasmacytic infiltrate was present in the subepithelial tissues. 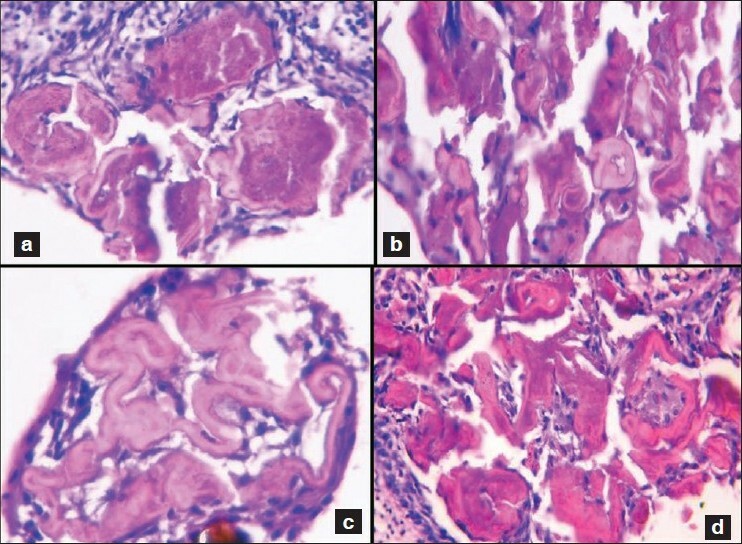 Tucked within the epithelium were groups of acellular, variable-sized eosinophilic structures (RB) of different shapes from straight linear, curvilinear, to irregular circular forms [Figure 1] and [Figure 2]. Occasional ones had concentric laminations. Some RB were refractile but not birifringent. These bodies were periodic acid-Schiffnegative but strongly positive with Masson's Trichrome and orcein stains [Figure 3]. RB were numerous in one case and few in the other. Thus, the origin of RB seems to have come full circle with the published data available today supporting the view first expressed by Rushton  that RB are odontogenic epithelial cell products formed in response to contact with particulate matter in a manner analogous to the formation of dental cuticle. 1. Rushton MA. Hyaline bodies in the epithelium of dental cysts. Proc R Soc Med 1955;48:407-9. 2. Mathews JB. Hyaline and foreign bodies in cyst walls. In: Browne RM, editor. Investigative pathology of the odontogenic cysts. Boca Raton, Florida CRC Press; 1991. p. 191-210. 3. Morgan PR, Johnson NW. Histological, histochemical and ultrastructural studies on the nature of hyaline bodies in odontogenic cysts. J Oral Pathol 1974;3:127-47. 4. Yamaguchi A. Hyaline bodies of odontogenic cysts: Histological, biochemical and electron microscopic studies. J Oral Pathol 1980;9:221-34. 5. Takeda Y, Kikuchi H, Suzuki A. Hyaline bodies in ameloblastoma: Histological and ultrastructural observations. J Oral Pathol 1985;14:639-43. 6. Shear M. Radicular cyst, residual cyst, paradental cyst and mandibular infected buccal cyst. In: Shear M, editor. Cysts of the Oral Regions. 3 rd ed. Mumbai: Varghese Publishing House; 1996. p. 136-70. 7. El Labban NG. Electron microscopic investigation of hyaline bodies in odontogenic cysts. J Oral Pathol 1979;8:81-93. 8. Shear M. The hyaline and granular bodies in dental cysts. Br Dent J 1961;110:301-7. 9. Browne RM, Mathews JB. Intra-epithelial hyaline bodies in odontogenic cysts: An immunoperoxidase study. J Oral Pathol 1985;14:422-8.